There was a buzz in the air at Merchiston Castle School, Edinburgh, as the School celebrated the birth of HRH Prince George of Cambridge. A special ceremony took place, which included the blessing of a bench placed in the school grounds. The bench has been engraved with the inscription, “HRH Prince George of Cambridge 2013”. Boys and staff who have the name George in their own names were invited to assist with the ceremony, including the School’s receptionist, Georgina! The School also marked the royal birth with two blue spruces planted in the School’s tradition. 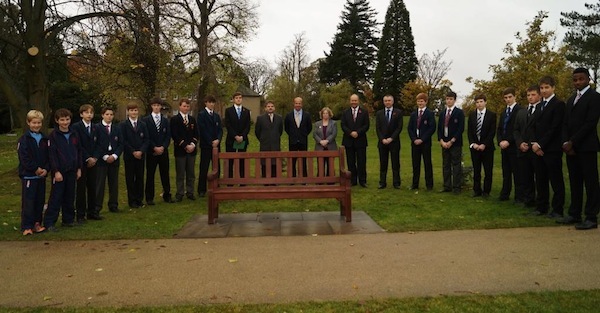 The School was led in a blessing for the bench and for the young prince by Alex Anderson, from the School’s Chaplaincy Team. Vice Captain of School, George, delivered an excerpt from Shakespeare’s Henry V on the theme of Kingship. Pupil, Benjamin, closed the ceremony by playing the pipes. Younger pupils then enjoyed refreshments in their Boarding Houses while staff and Sixth Form pupils enjoyed refreshments in the Dining Hall. Merchiston’s campus is close to 100 acres and there is an active tree planting programme within the grounds. The School has one of the largest tree collections in Scotland, after The Botanical Gardens, Edinburgh. In the 16th Century, Mary Queen of Scots planted a pear tree at Merchiston Castle, home of John Napier. The School has preserved a fragment of this pear tree and it is displayed in the School’s Old Library. When the School celebrated its centenary in 1933 the Duke and Duchess of York visited, the latter known so fondly later as The Queen Mother, and they planted a sycamore. This tree, with its brass plaque, stands on the high ground between Castle Gates and the main school building. Fifty years later, the School was enormously privileged when the Her Majesty the Queen and Prince Philip visited. She also planted a tree, on this occasion a copper beech. Merchiston marked the Royal Wedding in 2011 by planting a sessile oak.